Whenever a patient walks through the doors of the Jefferson Hospital emergency department, for at least a quarter of the 50,000 patients a year, it’s not just a physical condition that is ailing them. 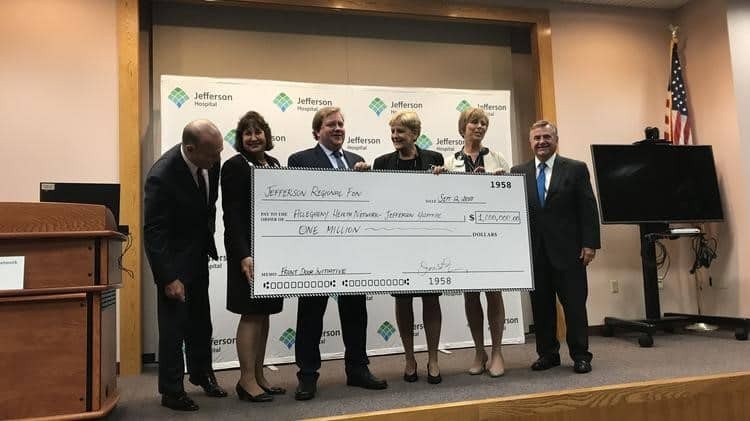 It’s why Jefferson and Allegheny Health Network has launched a four-year pilot program called the Front Door Initiative for Social Emergency Medicine at the South Hills hospital, funded by a $1 million grant from the Jefferson Regional Foundation. It will be used to identify and treat the nonmedical causes that bring people to the ER, whether it’s substance abuse or poverty or chronic health conditions that aren’t being treated by primary care or specialists. Dr. Richard Sullivan, director of Jefferson Hospital’s Department of Emergency Medicine, said that EDs are increasingly having to provide more than just emergency care and will be called upon to do so even more in the future. That includes referrals for further care, providing some patients two weeks’ worth of prescriptions to make it easier for them to adhere to their treatment plan and, for the first time this week at Jefferson Hospital, sending patients without means home with an emergency supply of healthy food. “We have to do more than just deliver health care,” Sullivan said. That’s going to mean a paradigm shift for emergency departments, and Sullivan and staff are already working on the specifics in this first stage of the plan: Reviewing the needs of the community and training staff to better take care of these patients, including seniors, children, the poor, immigrants, people who are struggling with behavioral health issues. “Our goal is not only to change the hospital culture now but how it will be in the future,” Sullivan said. That strategy is still being formed but it will include a more extensive discharge process as well as input from dietitians and other specialists who aren’t normally part of emergency departments, Sullivan said. The program “will help us more clearly see the whole picture and the health needs of the patients,” said Louise Urban, president and CEO of Jefferson Hospital. There are financial incentives, too. Sullivan expects when the program is fully implemented to see an immediate decrease in three-day and 30-day readmissions. And also rerouting patients from the ED, where the care costs between three and five times more, to primary care physicians. Jefferson Hospital’s Emergency Department is already undergoing significant updating with a $21 million project under way that will see its renovation and also increase in treatment and observation beds.